Back in April, His Nibs and I went to the opening night of a “British Tapas/Small Plates” venue called Arthur’s, and came away absolutely buzzing about the dishes on the menu and the talent of the Chef, Leo. Thankfully Leo, and his partner Amelia, liked us too (or at least our write up about their launch) and invited us back to try the seasonal menu for autumn that they’ve released! It was absolutely wanging it down, but even the ridiculous amount of rain wasn’t dampening our spirits; our curiosity and excitement were running high. We’ve been spoiled by a cracking summer and got caught out a bit by the rain - big brolly “Bertha” was nowhere to be found, so the small one had to suffice. Luckily for me, I have got a total diamond of a Man Bird – he let me have said brolly all to myself and braved the elements with just his trusty jacket on. Bless him, he’s a good ‘un. Amelia saw us arrive and swiftly offered His Nibs a towel to dry off; he did look rather bedraggled I have to say! I stowed Bertha just at the side of the door, not wanting to drip water everywhere. Amelia showed us to the table she’d set for us in the window and we cracked open the bottle of English wine we’d brought along with us from our friends at Amber Valley Wines, the Lindway White. Arthur’s aren’t licensed to sell alcohol at the moment, but do have a range of soft drinks for you to purchase if you prefer. The Man Bird and I are fairly relaxed peeps and quite happily go-with-the-flow, so we left it to Leo and Amelia to decide what dishes they wanted us to try from their autumn, 17-dish menu. Leo was already all a-bustle in the kitchen, assisted by a young lady. I love the atmosphere at Arthurs’s; it’s almost as if you’re in someone’s (very swanky) farmhouse kitchen. 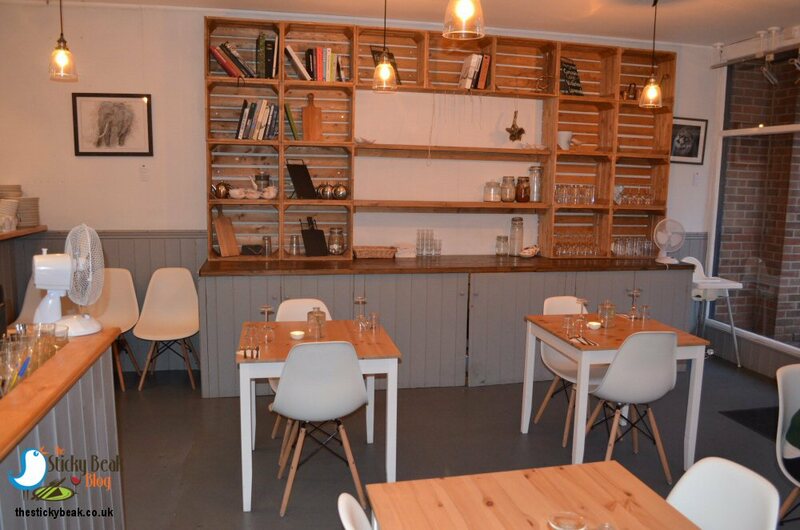 The tables are a pale wood with painted legs in a delicate grey shade, with complimenting tonal chairs and pale walls giving an airy, shabby chic-esque feel to the venue. Leo and Amelia have their kitchen open to the customers’ view, so you get all the sights, smells and sounds of your dishes being cooked. 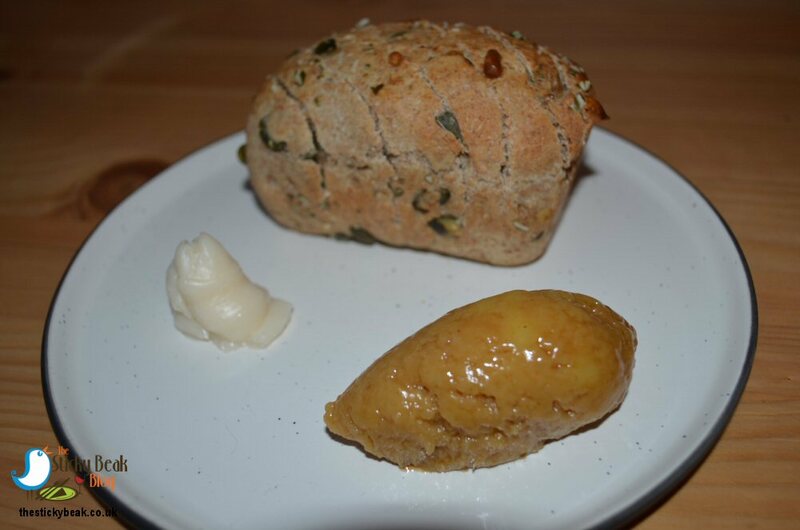 First item out of the kitchen was a mini Squash Seed loaf with a quenelle of Toffee Butter and a round of whipped, smoked Pork fat. The loaf was still wonderfully warm and sliced not quite all the way through - great for tearing and sharing. We both loved the delicate sweetness that the Squash flesh gave to the bread, as well as the softness it imparted. The seeds gave a fab textural aspect and gentle nuttiness to the loaf. We’ve had smoked Pork Fat before, and really enjoy the surprisingly subtle flavour of it. Leo whips it to give a superb lightness to it, and the tiny air bubbles make it even meltier on the tongue. The Toffee Butter that stole the show for us though; it was just as if you were eating toffee, but creamier (well it is butter after all!). Indescribably magnificent. 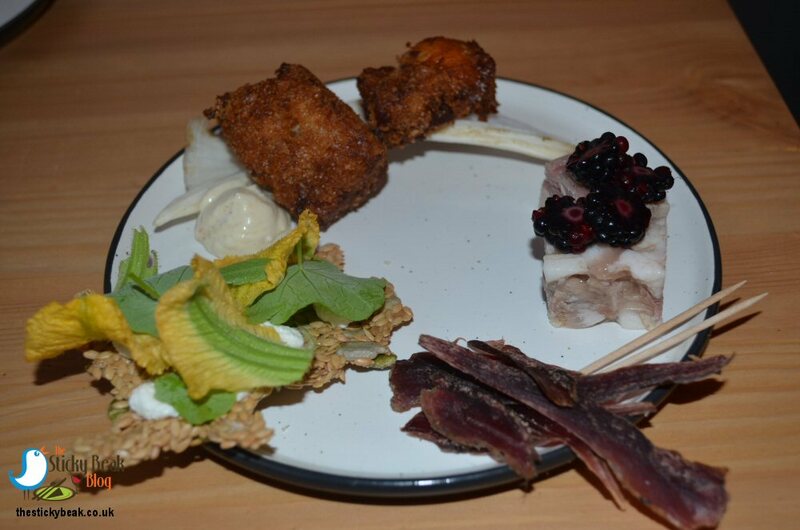 Next up was the platter of what is described as Snacks; comprised of Cod Head Croquettes, Pigs Head and Ham Hock Terrine, Mallard Ham, and Linseed Crackers. 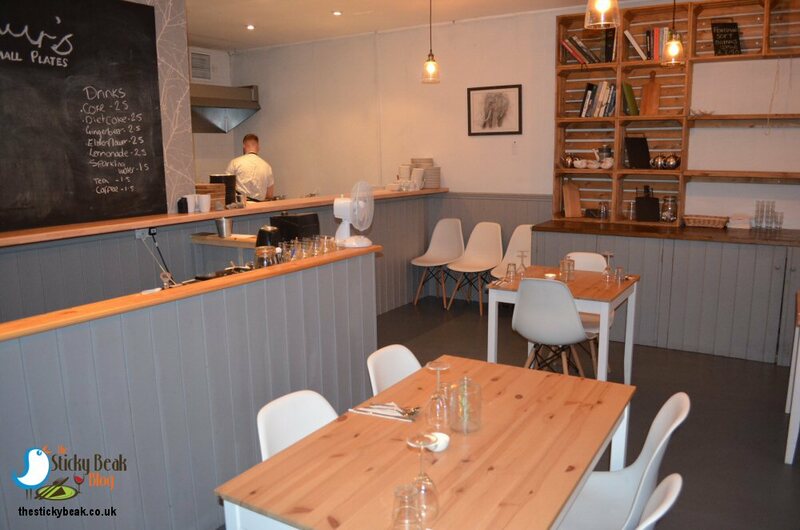 Amelia goes through each dish in fine detail, which I think is a really nice touch – John Boddice, Chef at Blenheim House in Etwall goes to this level too. Actually, Leo and John would get on like a house on fire I think; they both have unique, unfettered approaches to their craft and grow a lot of their own produce. Meet up guys, you can thank me later! Anyhow, back to the snacks. 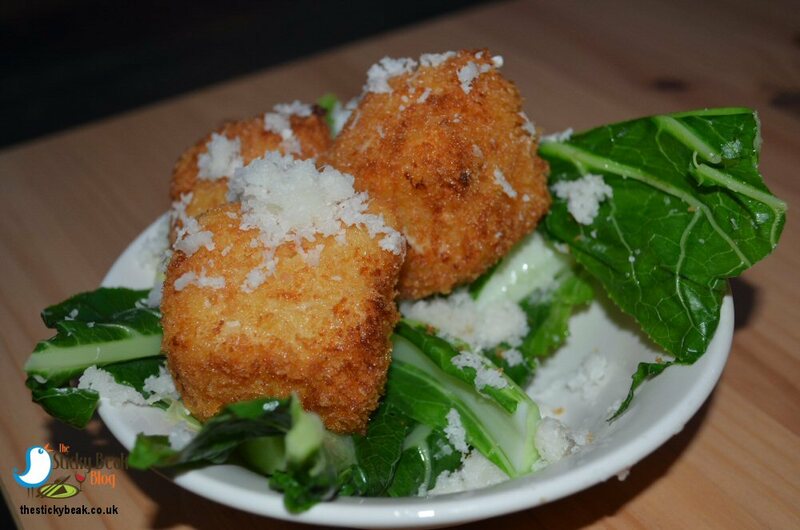 The Cod Head croquettes were delish; brilliantly crunchy Panko breadcrumb outers, and divine sweet fish inside. Both of us loved these simple but impactful bites.All I’m going to say about the Terrine is don’t be put off by the pig head aspect; when you think about it logically, the head is where you find the cheek, and this meat is delicious. This dish was soft, creamy and beautifully rounded and the fresh Blackberries that came with it really popped against the meat. Arthur’s has a supplier of fish and game who is lucky enough to own a lot of land with a river running through it. Consequently, Leo and Amelia have weekly variations on the meats and fish that they receive; this is why they describe menu dishes as “game bird” and “freshwater fish”, rather than being more specific. The reason I mention this is that previously, Mallard had been the game bird on the menu, and Leo air-cured the surplus meat to make the Mallard Ham on the snack platter. The Mallard Ham had a superb flavour; robust and rich, with a texture that was softer than first glance would suggest. Sliced uber-thin, this just melted in our mouths. Linseed Crackers were the final snack on the platter and were beautifully decorated with Nasturtium leaves and Squash leaves. Linseeds are small so therefore there were an awful lot of them in the cracker, making it lovely and dense in texture and very satisfying. You had to really take your time to chew these properly – no bolting them down! Their nuttiness was lovely and went well with the lemony notes of the Nasturtium leaves. 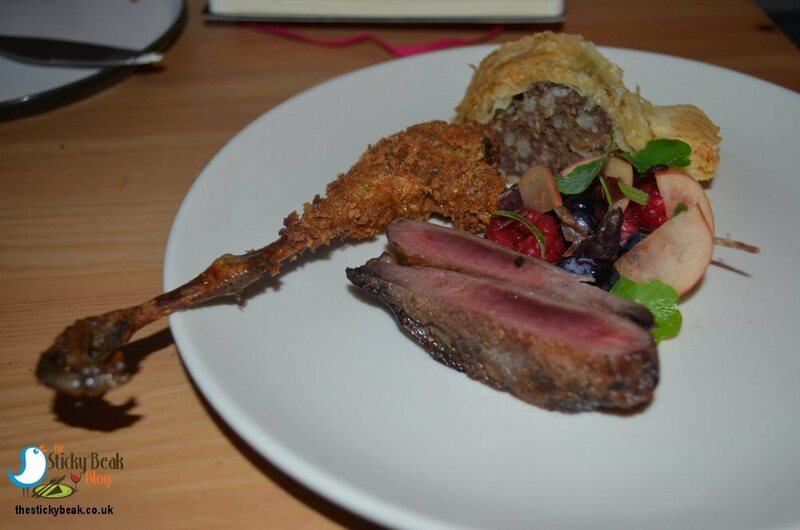 Grouse was the Game Bird on the menu at Arthur’s and Chef had prepared it three ways: the breasts, a sausage roll made with the Heart, and confit Leg (complete with feet and claws, which made it dead easy to pick up and hold). The breasts needed no pressure at all from the table knife, they were that tender! Grouse has a gently gamey taste, far more delicate than say Pheasant; or at least the breasts do, the legs are far deeper and earthier in flavour. All sense of decorum went out of t’ window as I sank my teeth into the leg, stripping away the precious flesh and savouring its richness. I’ve never had Grouse heart, but it’s blooming fab. If you like a rich full-bodied Pâté, then it’ll be right up your street, trust me. Wrapped in buttery, flaky pastry the deliciously rich heart meat was soft and seductive in the mouth with a gorgeous hint of Cinnamon to season it. Even the Man Bird surprised me a) by even trying it, and b) thoroughly enjoying it. Welcome to the offal appreciation society, boyo! The preserved summer Berries and Crab Apple slivers paired brilliantly with the Game, parrying its deep earthy elements with their bright, zingy flavours and crunchy texture. 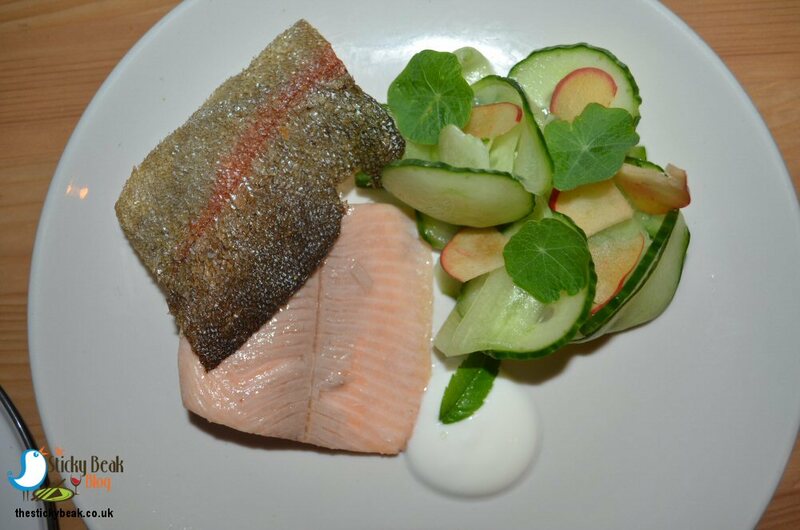 The next two dishes were fish: Fresh water Rainbow Trout with Chamomile, Yoghurt, and Cucumber and Crab Apple salad, and Sugar-and-Salt cured Mackerel with Anchovies and Seaweeds. Some foods are still sacred i.e. His Nibs won’t eat them, so I had the Mackerel all to myself – yes! 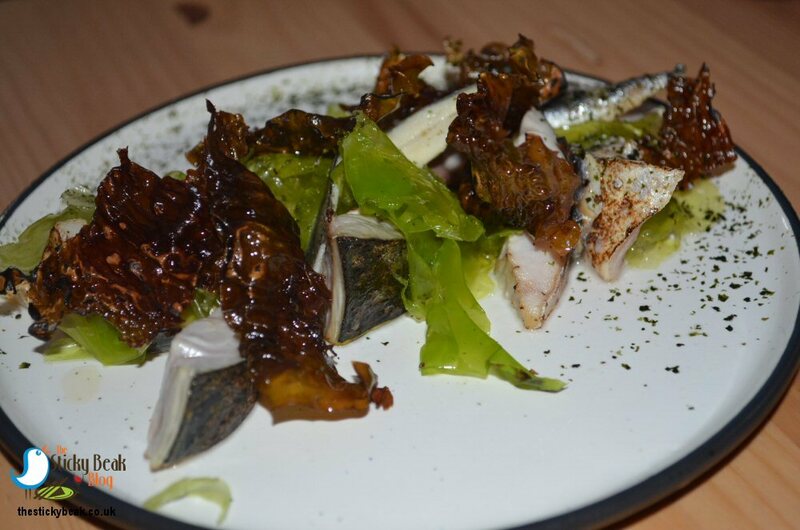 The Mackerel was beautiful, mild in taste with a nice omega-3 oily hint to it that lingered gently in the mouth. Leo blowtorched the Mackerel skin and the seaweeds, so texturally this dish had it all going on; smokiness, sea salt-tang and crunchiness. Anchovies lent their own unique salty edge to the dish and their distinct taste contrasted well with the more delicate Mackerel notes. To serve the Rainbow Trout, Chef steams it which releases the skin from the flesh cleanly. He then crisps the skin separately so you get the softness of the fish flesh against the crunch of the skin. I personally love the gentle blush tones of wild Rainbow Trout, and its moist flesh tasted just as delicate as it looked. The Boy Wonder was a fan of this dish too, even enjoying the fresh clean Cucumber and Crab Apple salad. Our final two savoury small plates were vegetable ones: Tenderstem Broccoli with Blue Cheese and Hazelnuts, and Cauliflower Cheese. I can’t even begin to tell you how excited I was at the prospect of eating one of my favourite comfort-foods. I eat Cauliflower Cheese year-round, but when the weather gets cooler, this is just the bomb! At Arthur’s in Belper, Chef Leo combines the Cauliflower and melted cheese, then freezes it before coating it in breadcrumbs and frying the balls. The result, when it comes before you, is a fabulously crunchy outer that gives way to possibly the most exquisite oozy centre that you’ll ever come across. I loved the punchy cheese Leo uses; combined with the creamy Cauliflower notes, it was the perfect partnership. This was “poshed up” comfort food at its best - soft, seductive and sensual in the mouth; not to be rushed in any way. Unusually, these balls of awesomeness were served on a verdant bed of cooked Cauliflower leaves whose stalks have a “spring green” taste very much like cabbage, and the wilted leaves have a character not unlike Spinach. In homage to the autumnal season, Chef had topped the Veg ‘n’ Cheese parcels with a “frost” of grated Cauliflower. 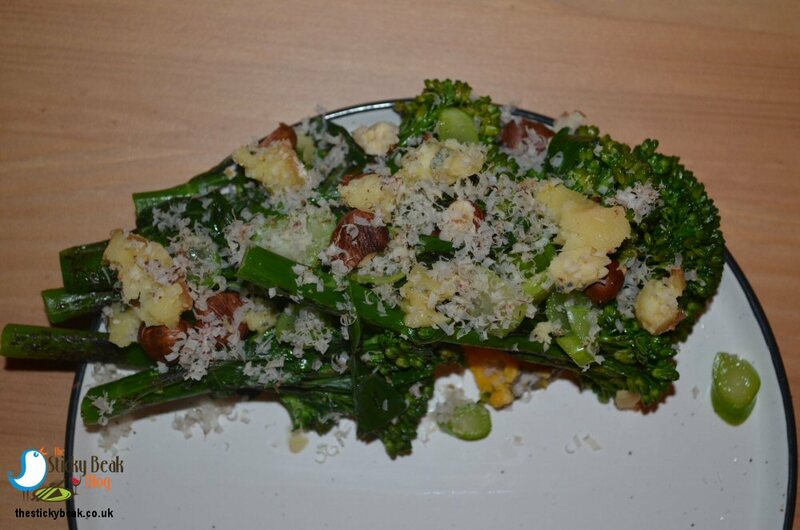 His Nibs did partake of the Tenderstem Broccoli spears, albeit after he’d checked there was no speck of Blue Cheese on them! They were marvellously crunchy in the mouth, in contrast with the soft, unctuousness of the semi-melted cheese that had lain underneath them. The whole Hazelnuts (ha, I bet some of you sang the old advert for Cadbury Whole Nut Chocolate just then didn’t you? Admit it!) added even more texture to this dish. All the food had been strikingly presented, with a pleasing variety of colours on each plate, and everything was meticulously placed, nothing was skewiff. Literally you could tell that Chef had poured his heart and soul into it. But there was more to come; a trio of puddings and the sweet plate all lay ahead of us. Simply and enigmatically described as “Brown Butter, Apples, and Smoked Pork Fat” our first dessert would be right at home as the cross over course on a tasting menu. This morsel was a curious combination of flavours that managed to be both sweet and savoury; the inclusion of the Pork fat made the dessert wonderfully rich and satisfying, with the Apples providing a tart note to assuage the richness. We tucked in to the White Chocolate, Butternut Squash, and Sage number next; again not knowing quite what to expect. As it turned out the Squash was pureed and incorporated into the ice cream where it gave a beautiful colour as well as a gentle savoury hint. 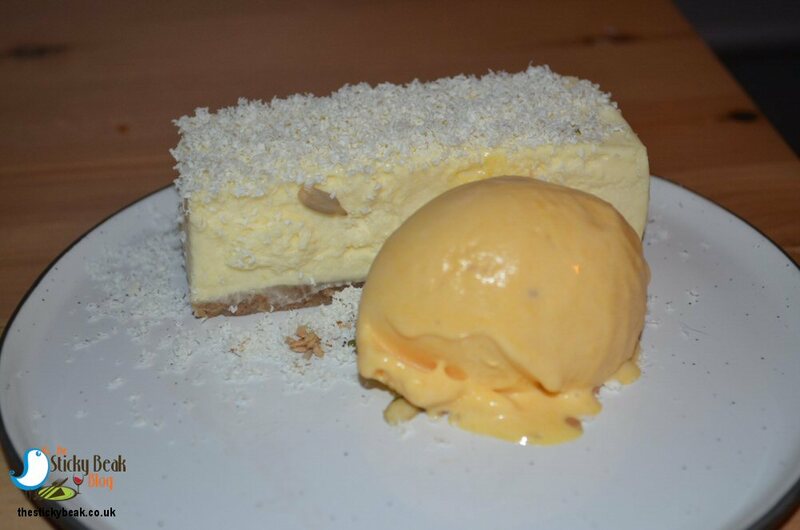 The lovely White Chocolate mousse was incredible; indulgent and creamy, and lay atop a just-soft biscuit base. 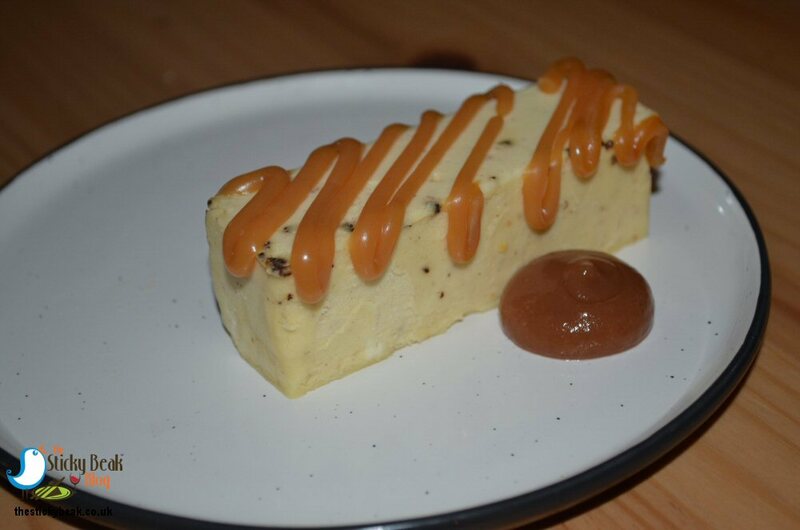 Thanks to the ice cream providing a less sweet element, this dessert would be perfect for those who don’t want an overly rich end to their meal. The Pineapple Weed (aka Wild Chamomile) curd tart with sour cream was another alchemical concoction of delight. 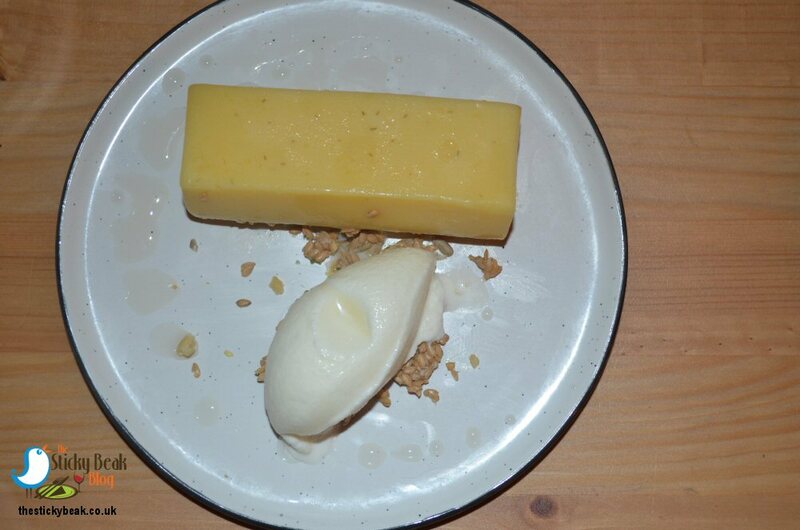 There was a lovely sweet zing from the Pineapple weed that bounced on the palate, and combined with the fresh clean taste of the soured cream it produced a balanced, nicely executed dessert. 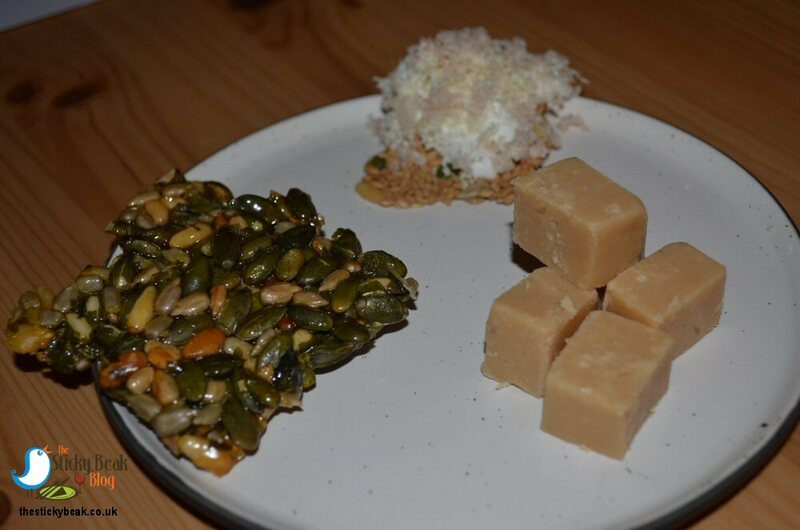 Amelia brought us over a couple of black coffees to have with our assiette of sweets: Smoked Fudge, Pumpkin seed Brittle, and Linseed Cracker with Meringue and White Chocolate. The fudge was a complete mystery for the brain and palate to try and reconcile; fudge should be tooth-tinglingly sweet, not bonfire night smoky right? I don’t know how it does, but it works. Leo has got the smoky-sweet balance just right. Weirdly good. Sticky to the touch and nicely sweet, the Pumpkin seed Brittle was delicious; it had a beautiful texture and crunchiness, and the nuttiness of the seeds was lovely. The nutty theme was carried on by the Linseed crisp, covered in soft Meringue and white chocolate. Meringue and I don’t get on, so this soft temptress reeled His Nibs in with its come-hither-and-eat-me lustre. Topped with tiny creamy flakes of white Chocolate, this morsel could easily have tipped into sweet overload, but the savoury Linseed reined it back from the brink skilfully. Hot Wings unreservedly awarded to this tight-knit team. Belper folk, you aren’t half ruddy lucky to have this in your town! 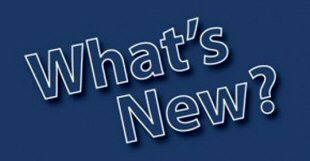 Booking ahead is essential for weekends, and given that over half the tables were taken on a midweek night when we went, I would advise booking whenever you plan to go.